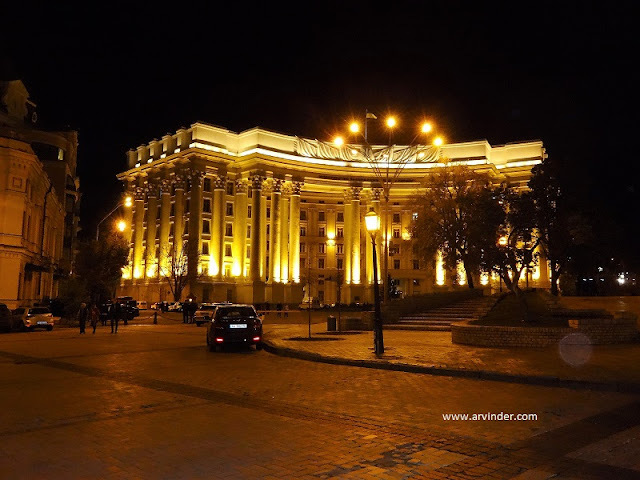 In October 2017 I was travelling from Austin Texas to Yerevan Armenia and had a 18 hour stopover in Kiev Ukraine. Immigration is quick and easy, no long lines. On a chilly October evening, my flight arrived at 5 PM, I had researched before going to Kiev on transportation from Kiev Boryspil Airport to the city center, a cab river approached me and offered to take me to the city center for 50 USD, I laughed at him and negotiated the price down to 20 USD. There was an ATM, I changed money and was off to the city center. 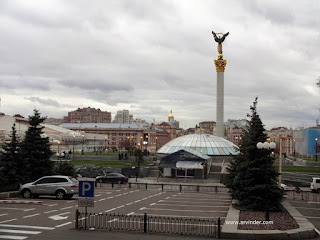 At the time of writing this 1 USD = 26.0485 UAH Ukrainian Hryvnia. So basically 500 UAH was my price for the cab ride. 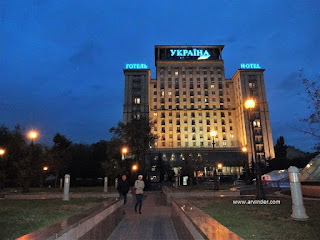 I was staying at a Soviet era hotel, Hotel Ukraine.The location was just perfect, hotel overlooks Independence Square. Walking distance to Eating places, entertainment and shopping. The first picture above is the Independence Square, taken from outside the hotel and 2nd is the Hotel Ukraine, a part of Soviet History. The biggest advantage was it was right next to the main street in Kiev, khreschatyk street. I was there on a Saturday, khreschatyk street was blocked off and there were bands playing on the street and tons of other entertainment like street performances. After checking into the hotel and a warm shower later, I was off to explore the city on foot. 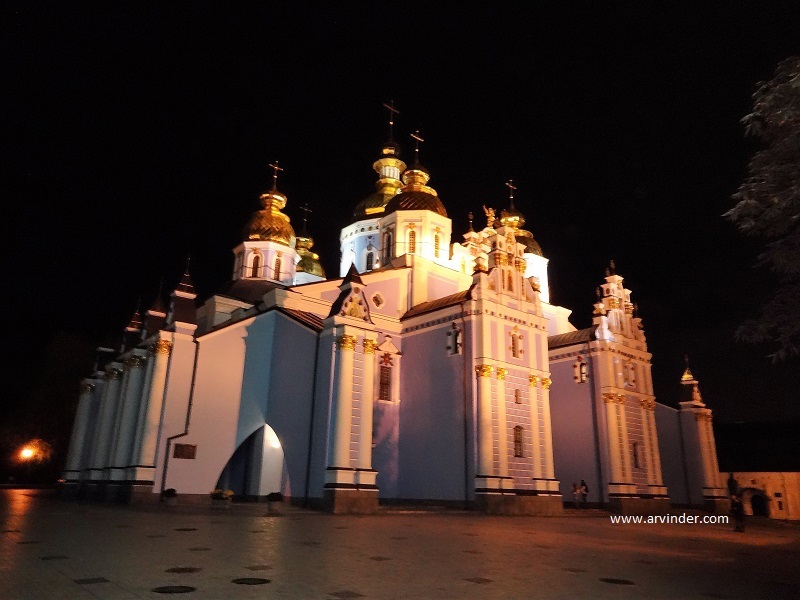 Then I took off on foot to explore the city by foot, Kiev has beautiful Churches and Monasteries, below St. Michael's Golden-Domed Monastery, photography and video was not allowed inside, it was beautiful though. Walked the streets taking photos, if anyone knows whats the name of the building below, please leave in the comments. I ended up getting a bite to eat at a sandwich shop on my way to the hotel as I had an early morning flight. Then I thought its a Saturday night, might as well have fun, so went to khreschatyk street where people were dancing on the street. Made it back to the hotel just after midnight and the had the reception do a early morning wake up call. Woke up at 6-30 AM, shower and free breakfast, which was awesome and at 7:30 AM cab ride back to the airport. Again the cab cost was 500 UAH. I was off to the Caucasus. First stop Yerevan. Wow... I can see how confident you were negotiating with the Cab driver. 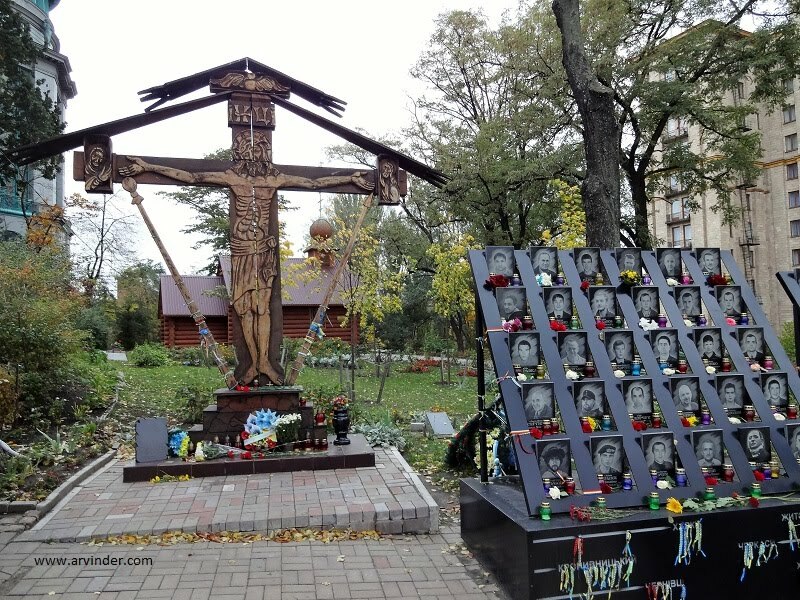 I guess this was your first time visiting Ukraine... We are often faced with some of these challenges visiting a place for the first time... But It doesn't really matter when the goal is to *explore*. Thanks for sharing your experience.